MORGANTOWN, W. Va. (May 15, 2013) – Following months of anticipation, the 2013 Lucas Oil Pro Motocross Championship, sanctioned by AMA Pro Racing, kicks off this Saturday, May 18, at the Prairie City OHV Park in Sacramento, Calif. for the 45th running of the Red Bull Hangtown Motocross Classic. This weekend’s opener sets the stage for an epic season of racing in both the 450 Class and 250 Class, as the champions of each division-Ryan Dungey and Blake Baggett, respectively-return to defend their titles against one of the most competitive fields in the sport’s history. In addition, Hangtown will host Round 1 of the inaugural Women’s Pro Motocross Triple Crown, featuring the fastest WMX racers in the country. As the longest-running event on the championship calendar, the Red Bull Hangtown Motocross Classic actually precedes what is now known as the Lucas Oil Pro Motocross Championship and boasts a devoted local following. The iconic Hangtown track, constructed by the Dirt Diggers North Motorcycle Club, features a vast array of elevation changes and highly-technical obstacles, set in a natural amphitheater which provides race fans with spectacular viewing from almost any vantage point. Hangtown also kicks off an unprecedented telecast and online streaming coverage for Lucas Oil Pro Motocross Championship, featuring 63 hours of competition from all over the nation. NBC, NBC Sports Network and FUEL TV will combine to showcase live coverage from all 12 rounds this summer. In addition, more Lucas Oil Pro Motocross Championship races will be live streamed than ever before. Coverage of this weekend’s Red Bull Hangtown Motocross Classic begins this Saturday at 4 p.m. ET with the opening 450 and 250 motos on FUEL TV, with second motos to air on NBC Sports on Monday at 12:30 a.m. ET. For more information about dates and times of these broadcasts, contact local satellite or cable providers. After a highly successful season in 2012, during which he claimed 10 of the 12 national victories and his second 450 Class Championship, Red Bull KTM’s Ryan Dungey returns this season to defend his title. Dungey’s nearly flawless performance proved to be a breakthrough season for KTM, securing the Austrian brand’s first-ever championship in the 450 Class. However, this season presents an all-new set of challenges for Dungey, who hails from Belle Plains, Minn., as a deep field of superstars will line up next to him. Returning to Hangtown is the 2011 Series Champion, Monster Energy Kawasaki’s Ryan Villopoto, who was forced to sit out last season due to a knee injury. Since then, Villopoto scored his third consecutive AMA Supercross Championship, giving him a boost of confidence heading into the summer. Yoshimura Suzuki’s James Stewart also returns to the mix after missing most of last season due to injury. However, a healthy Stewart could pose a threat to the rest of the field this weekend as the Floridian swept both motos at last year’s Hangtown opener to defeat Dungey. Coincidentally, Stewart and Villopoto have never faced off against each other in motocross while racing in the same class, which shows the unprecedented depth of competition featured in this season’s 450 field. Another rider returning from injury this season is 2009 Series Champion Chad Reed. A knee injury forced the veteran Reed to the sidelines last summer, but the TwoTwo Motorsports Honda rider is back in action and ready to challenge for another championship. And then there’s Team Honda Muscle Milk’s Trey Canard, who has been plagued with injuries over the course of his career but still continues to demonstrate great resilience in both recovery and race results. Canard will line up at Hangtown this weekend for the first time since his 250 Class championship-winning season in 2010. Familiar contenders from last season’s championship will also be in the hunt, including 2012 series runner-up Mike Alessi of the MotoConcepts Smartop Racing Team, as well as Joe Gibbs Racing Yamaha’s Justin Brayton and Josh Grant. In addition to the return of several 450 Class veterans and past champions, a couple of familiar faces will also be joining the 450 Class title chase this season. Team Muscle Milk Honda’s Justin Barcia and Monster Energy/Pro Circuit Kawasaki’s Dean Wilson will both make the jump from the 250 Class to compete against the nation’s most elite 450 motocross racers. Barcia proved his merit amongst the talented field by finishing inside the top five in the 2013 supercross season, and was also a threat to win during guest appearances on a 450 in previous seasons. And Wilson, the 2011 250 Class Champion who is a native of Scotland, will enter the 450 Class for the first time this summer, alongside his teammate Tyla Rattray, a former World Motocross Champion who hails from South Africa. Other riders to watch this season include Monster Energy/Kawasaki’s Jake Weimer, BTO Sports KTM’s Andrew Short and Michael Byrne, and RCH Racing’s Broc Tickle, and many others. This season’s 250 Class Championship should boast one of the most exciting championship battles in series history, as Monster Energy/Pro Circuit Kawasaki’s Blake Baggett returns to defend the #1 plate he earned in a hard-fought summer of 2012. Baggett is a past winner of Hangtown, who many consider to be the fastest 250 Class racer on the planet, though he has struggled to stay healthy since earning his first professional title last season. The Californian will face the same onslaught of competitors that made for a memorable 250 chase last season. Red Bull KTM teammates Ken Roczen and Marvin Musquin are fresh off a successful supercross season, with Roczen taking his first-ever 250SX Western Regional Supercross title, and Musquin finishing a close second in the East Region. Both Roczen, who hails from Germany, and Musquin, a French athlete, are former World Motocross Champions hoping to show their mettle here on the Lucas Oil Pro Motocross Championship. GEICO Honda’s Eli Tomac, who finished third in the 250 Class in 2012, also returns this summer with a championship on his mind. He will be joined by younger teammates Justin Bogle, who hails from Oklahoma, and the quick-starting Zach Bell, a resident of Cairo, Georgia. And then there’s Zach Osborne, a veteran racer from Virginia who spent much of the last five seasons on the Grand Prix tour in Europe. There’s no counting out veteran riders like Rockstar Energy Racing’s Blake Wharton and Nico Izzi, Monster Energy/Pro Circuit Kawasaki’s Martin Davalos, or Lucas Oil Troy Lee Designs Honda’s Cole Seely, as all four racers have proven to be serious contenders in the past. Even rising stars like Rockstar Energy Racing’s Jason Anderson and Lucas Oil Troy Lee Honda’s Jessy Nelson must be counted in the mix in this talent-packed division. And then there is the next generation of future stars that will add even more excitement to the competition. The recent confirmation of amateur motocross sensation Adam Cianciarulo to line up at this weekend’s Hangtown Motocross Classic for Monster Energy/Pro Circuit Kawasaki has garnered much attention already, while Cianciarulo’s longtime amateur rival Cooper Webb also debuts his Pro Motocross career this weekend with the MyPlash Star Racing Yamaha team. Star Racing Yamaha’s Jeremy Martin and Monster Energy/Pro Circuit Kawasaki’s Justin Hill both showed great promise during the supercross tour and are expected to be top-five challengers. And yet another rookie contesting the Nationals for the first time ever is FMF/Orange Brigade/KTM racer Joey Savatgy. All of these young athletes have enjoyed great success in the amateur ranks and will look to make an immediate impact at the Red Bull Hangtown Classic. The Women’s Pro Motocross Triple Crown will make its debut this weekend at the Red Bull Hangtown Motocross Classic. 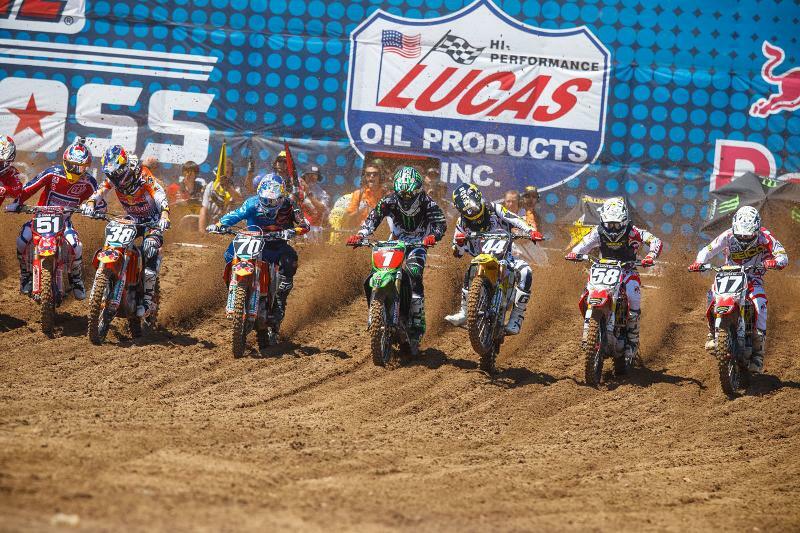 The WMX Triple Crown consists of three stops along the 2013 Lucas Oil Pro Motocross tour, with Round 2 taking place in Mt. Morris, Pa. for the High Point National and the final stop at Moto-X 338 in Southwick, Mass. Six-time WMX champion Jessica Patterson leads the way in a stacked class of WMX competition aboard an N-Fab/TiLube Yamaha. Also returning for Round 1 is Brazil’s Mariana Balbi and KTM backed Alexah Pearson, as well as Japanese rider Sayaka Kaneshiro, who grabbed her first career podium finish at the High Point National in 2012. 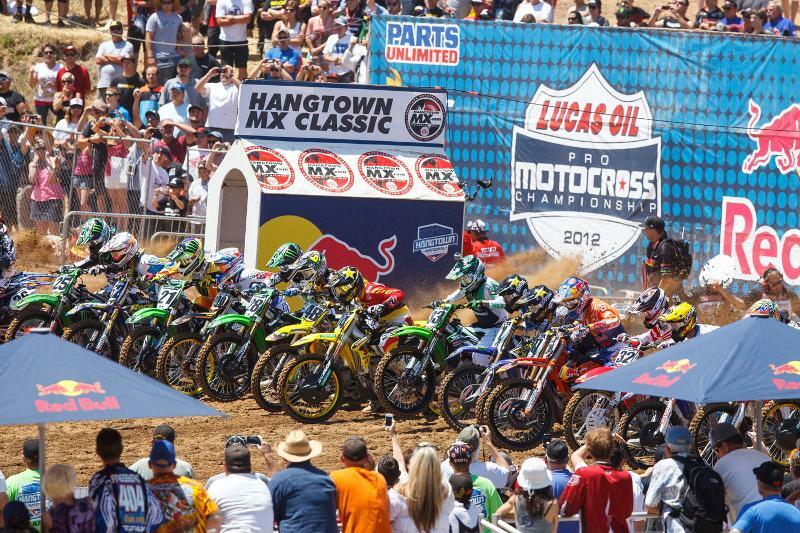 Racing at the Red Bull Hangtown Motocross Classic begins at 4 p.m. ET on Saturday, May 18, with competition in the 250 Class and 450 Class, as well as Round 1 of the WMX Triple Crown.